One Way Ticket to Hell and Back! pop quiz: the lyric above is from what song and artist? clue: they turned the lights out in Suffolk, a galaxy far, far away. This time last year we were heading to Finland to help celebrate a 50th Birthday with a bit of bucket list ticking. Northern lights, husky sledging, reindeer ride, ice bar, cross country skiing, snow-shoeing, ice driving, skidoo trip and ice lake dipping – you know the sort of stuff. As we were giving up some of our usual European skiing to join in, we decided to add a week to the trip and go skiing in Yllas. This meant we had to take skis on a flight, something we’d not done before; we usually drive to Europe. This meant we needed a ski bag. A big selling point they were pushing was the adjustable length of the bag to accommodate different length skis. Our longest skis are 176cm, our shortest 159cm, for both the go in a bag it needs to accommodate the 176cm. So as long as the bag we buy can fit our skis, it doesn’t need an adjustable length. Really, who wants to carry around a bag with ‘Douche Bag’ written large of the side; what were the brand guys (and I’m guessing guys!) thinking? 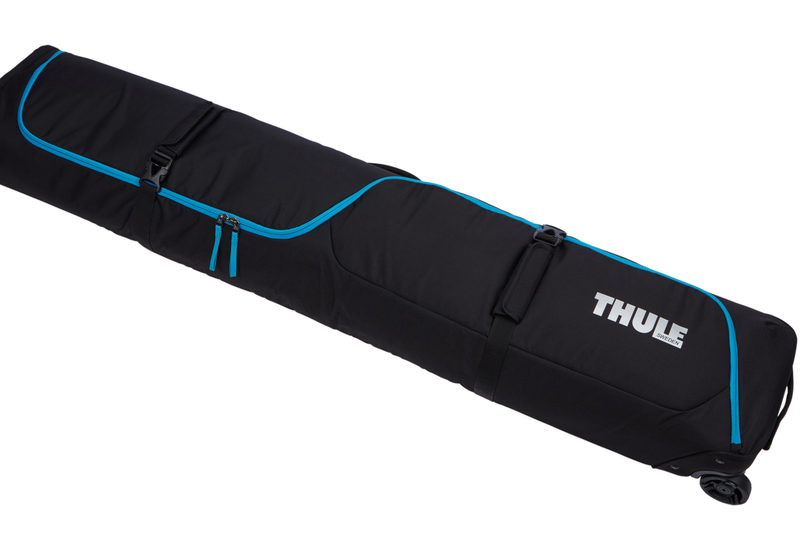 Features and Thoughts of the Thule RoundTrip Ski Roller Bag. The RoundTrip is padded. If you are going to trust your skis to airport baggage staff this is a must. The padding successfully protected our skis from all they could ‘throw’ at it. It is stiff. When pulling it around it does not sag at all. Good wheels and well positioned handles. We had no problems with stuck wheels on stairs or kerbs. The various handles meant it was convenient to grab and drag. Stuff sacks. The RoundTrip comes with two quite large stuff sacks which have been designed with a pocket that slips over the top of a ski. We two-thirds filled our stuff sacks with little, soft stuff; socks, pants, PJs, T-shirts and the like. This meant we could slip each one over a ski at each end of the bag and squidge them about to secure the skis in place – genius! Internal zipped pockets. We used these for toiletries and other personal essentials. S-shaped zip that can lock. Obviously locking your bag through airports is a must. The zip shape means you can open the bag and rifle through the contents easily, without having to get it all out. Ski divider. A padded divider is supplied with the RoundTrip to put between sets of skis. It protects them from each other and also helps keep them stable in the bag. Internal and external compression straps. Once packed you can secure everything inside with straps and then once zipped up, additional straps add more compression and security. Deceptively spacious. We fitted two pairs of skis, two sets of poles, all our underwear and most of our other gear for a two-week trip in the bag. The only extra luggage we needed to take was hand luggage for ski boots and we wore our ski jackets. We are really impressed with the Thule Roundtrip. After just two trips through airports and transfers it no longer looks new, but it hasn’t sustained anything other than becoming a bit grubby. It seems as though we might have to take flights to ski resorts a bit more often. pop trivia: UK rock band, ‘The Darkness’ had a hit single with ‘One Way Ticket’ in 2005. The line was also the title of their second album; ‘One Way Ticket to Hell and Back’. The video for the single opened with a text crawl with ‘Star Wars’ references. Finnish Cross Country Skiing Experience.